It’s every surfer’s dream to hop in a truck with a few boards and venture into the unknown in search of the perfect wave. 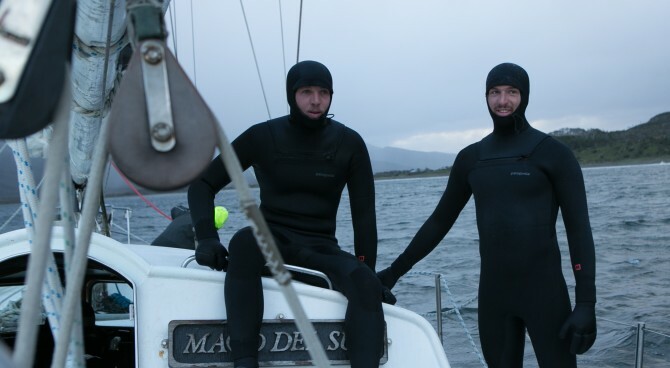 This is precisely what Joaquin and Julian Azulay, two Argentinian brothers, dreamt of before embarking on a trip from California to Chile that would change their lives forever. The brothers are often referred to as as the “Gauchos del Mar,” meaning cowboys of the sea in Spanish. The name was given to them by an American living in the desert of Baja California for their passion for surfing, habit of drinking mate, and, of course, their Argentinian roots. The following interview took place between touring and premiering their second film Tierra de Patagones. Gauchos del Mar, your first documentary, was born from your first trip through the Pacific Coast from California to Chile. How did you come up with the idea of documenting your travels along the coast? On the first documented trip, our goal was to fulfill the dream we had since we were young. Traveling and surfing for a long time from California to Chile. It all started in March 2010. We were working 14-16 hour days in Los Angeles for an architectural project for our older brother, and we barely had time to surf. We wanted to save some money so we could go to Hawaii, but after a morning session in Manhattan Beach, Julian changed his mind and decided to save a little more money, buy a truck, and drive all the way back to Argentina. I didn’t hesitate when Julian came up with the idea, and the trip had begun without us even planning it. The trip was always in our minds, but we just needed to take the plunge and go for it. At the beginning, we just filmed for the memories of an amazing trip of brotherhood. But then we started a blog, uploaded pictures and videos, and then the Facebook page came. All of the sudden people started following our posts and the idea of a documentary was born. Unexpectedly, the documentary had a lot of impact and we won nine awards in international film festivals. 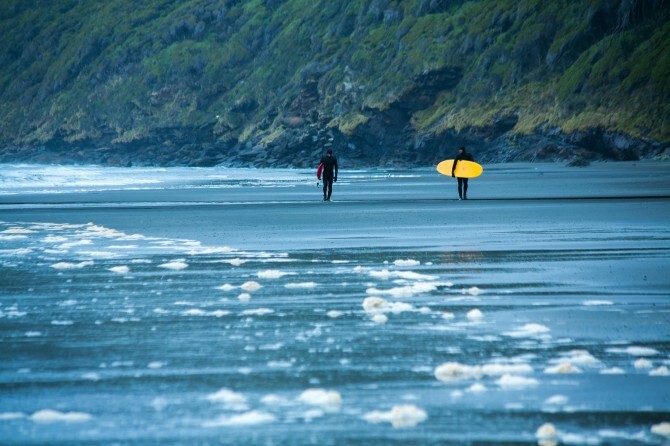 After the first film, why did you decide to surf the famous region of Patagonia? When we got back from our trip through the Pacific Coast, we realized that we knew little about our own country’s coast, which is nearly 3,000 km long. We thought it was necessary to immerse ourselves and find waves into those unknown regions that we call home. Patagonia was the only region pending on our surf trip through South America, so we decided to plan our second trip and consequently, Tierra de Patagones, our second film, was born. You have surfed the Isla de los Estados and other hidden gems. What does it feel to surf in such wild places where only very few have surfed before? Exploring waves in new places and expanding our horizons is an amazing feeling. And if that is shared with a friend or brother – which in my case Julian is both my brother and best friend – it only gets better. We love surfing and being in contact with nature; it’s our passion. It’s the drive that keeps us alive. Being in the ocean and surfing is what brings us utter joy. And when you find that thing that makes you tick, you try to do it as much as you can. Surviving the extreme conditions in Patagonia. That is ice, not foam. How did you deal with the extreme temperatures and hostile weather of Patagonia? What was the hardest part of your journey? Did being brothers help push through the adventure? Patagonia is one of the most unique places in the world. Not only because of its extraordinary wildlife and landscape, but also for its crazy and ever-changing weather patterns. Searching for waves is hard mainly because swell, wind conditions, and tides are very inconsistent and unstable. Extreme low temperatures are the reason why “gauchos” and local people are generous in welcoming newcomers. Also, because they rarely get visitors. Being brothers and growing up surfing together strengthened our bond and helped us deal with the coldest nights, sleeping outdoors, freezing sessions, and being away from home. These trips brought us closer together. When traveling, you came across deserted landscapes and unspoiled nature. What message do you bring regarding man’s footprint on the Earth? Most of Patagonia’s land is private property and there are only a couple of small cities. You can see the difference between cities and large ranches where the people who guard these ranches are very protective and take care of their land in a way we’ve never seen before. They have a deep connection with nature because nature provides them with food and water. On the other hand, the cities are polluted and you can see garbage and large quantities of plastic carried by winds, contaminating these pristine regions. It’s a pity that the most preserved places stay that way because men haven’t set foot in it. We wish to transmit the message of the importance of protection and conscience of nature for the sake of its continuity. Following the success of Gauchos del Mar and Tierra de Patagones, what is your next step? We are shooting our next film in Peninsula Mitre, just east of Tierra del Fuego in Argentina. This time we will walk 300 km for a month and a half. We will have no communication whatsoever and the main idea is to share our environmental mission of reconnecting with nature, staying away from consumerism and surviving from what local farmers have to offer in order to make our life as sustainable as possible. Last but not least, what drives you? The idea behind our documentaries is to encourage people to follow their dreams and passions. It’s not just about surfing or being the best. It’s about doing what you love the best way possible. Our aim is also to show the communities and crafts that have been forgotten, and to interact and learn from the local cultures, which have been so generous to us. We also want to show the connection between humans and nature, which seems to have been lost in our technological-driven era. Furthermore, in doing so, we are creating awareness of what we have and where we live. As in turn, we are empowering and preserving our own culture. For more of Joaquin and Julian’s wild adventures, visit GuachosDelMar.com.